The diary was transcribed by independent researcher and moving panorama historian Suzanne Wray from Brooklyn, NY. This rare manuscript is from the Maine Historical Society via The Saco Museum and Peter Morelli. It was transcribed by independent researcher Suzanne Wray of New York City. The diary was written by "Dr." L.E. Emerson who performed a moving panorama entitled The Grand Moving Mirror of California. Emerson toured New Hampshire and Maine from Sept. 11th to Nov. 9th 1855, transporting the moving panorama in a horse drawn wagon. The moving panorama did not survive, but the lecturer’s script and his diary of the tour did. 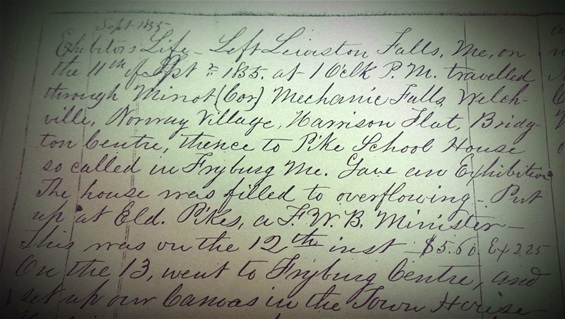 The diary kept by "Dr." Emerson describes the challenges he faced as a moving panorama showman in the mid 19th Century. As they pulled into a little village, they would need to find a place to perform. That might be a meeting house, town hall, church or school house. Finding a place to spend the night could be difficult as not every town had a hotel. They might have to persuade the local minister that the show was reputable and not scandalous! The diary shows their expenses and earnings for each show, weather conditions and the state of the roads. Enjoy! 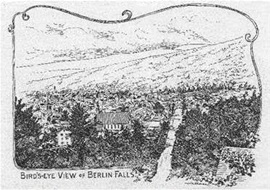 Berlin Falls, a bird's eye view. P.M. of the place, a justice of the peace, objected to our using the town House, but finding that all his neighbors were against him, he ingloriously “caved in”. Understood his name was Lamson. Expect he is kin to old crazy Father Lamson, who used to preach on the walks in Boston. Had a good audience, and didn't burn up the town house, though friend Lamson had great fears we should, and this increase his taxes, as well as our own. Took $6.00 Ex.2. scenery of the mountains is beautiful. Here are three hotels. We “set up” in the Academy Hall. in and took a seat at the table. The gentleman asked me to help him a dish of meat that stood near by at the same time enquiring “What is this Sir”? As it was mutton, a very common dish, I thought I would “answer a fool according to his folly” and replied “Turkey this is Turkey”! Said the lady “what is it”? He says it is turkey but it don’t look much like it said the “big bug” at the same time helping his “better half” to a generous slice of the supposed Turkey. I could hardly repress a smile, but finally concluded that “big bugs” were full as ignorant as other “bus” that were not so big. thence to Gorham N.H. 8 ms. Walked over the mts and got somewhat fatigued. 1200.00 at her disposal. She counted it over & handed it to him, & he locked it up in his desk. They transported the moving panorama in a horse drawn wagon. some 8 or 10 Stores. 30 Took 7.50 Exp 4.50 & 1.50 for ?stamps? Canaan Vt. We are some 30 miles from Canada line. Oct 2d Drove to No. Stratford. It commenced raining at 4 P.M. & rained incessantly till 12 ? place. Set up in an old Orthodox Church. Fair day to day. Roads muddy. Had a good house. Oct 7. Sunday. Pleasant, but rather cool. Drove 8 ms to Hegan (N. Stratford) & 8 ms to Stratford Hollow. And 10 ms to Lancaster, & 5 1/2 ms to Lunenburg Vt. Total 33 1/2 ms. Here, are 3 Stores, 2 M.Hs. a Town Hall & some 12 or 14 buildings around, all on the top of a hill 1 1/2 ms from the Con. Riv. Engaged the Town Hall to set up our “Machine” in. House. Suspected “spirits” have an abode here, by the mysterious “raps” heard in the vicinity. October 11 Drove 4 ms to the quiet village of East St Johnbury. Here are 3 small stores. Messers Thompson & Parker, Melodists. Taken well so far. This Eve attended church in Cabot. Stop at Hotel. Set up in School House. Pay 1.50 for the House. Bad night for us: dark & rainy. 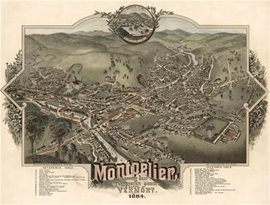 Paid 40 cts for Camphene & 1.75 for Bills at Montpelier. actions & appearance should jude (judge?) him to be a very mean man. Donation Party, a Singing School, a Lyceum & a Literary Institute besides to Pana of California. weather as this, “Cant do a thing.” In the way of exhibiting. dinner. 37 1/2 for Camphene 08 ? Shoeing Horses, Total Ex 4.32. Sunday Nov 4. At Coventry. A small village. Here are 2 Stores a saw & a grist mill. Nove 6. Drove to Derby Centre. Quite a place. Set up in the Town Hall,­Here is a good School. 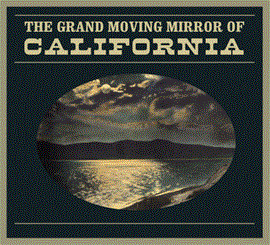 The remake of the Grand Moving Mirror of California premiered in 2010 at the Veleslavasay Panorama in Los Angeles. Fast forward to the 21st century! Peter Morelli sent the lecturer’s script for the Grand Moving Mirror of California to Sara Velas, Director of the Velaslavasay Panorama in Los Angeles. She and a crew of dedicated artists recreated the Moving Panorama of California in spectacular form! You can read more about it on the Crankie Factory's page The Grand Moving Mirror of California. Visit Sara’s website panoramaonview.org. Heartfelt gratitude to Peter Morelli for giving me permission to reprint this diary and for all the work he has done over the past 20 years to preserve and make available, artifacts and information about the history of moving panoramas. Read about his work on the Crankie Factory's page about the Moving Panorama of Pilgrim's Progress.